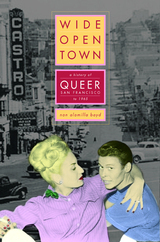 Wide-Open Town traces the history of gay men and lesbians in San Francisco from the turn of the century, when queer bars emerged in San Francisco's tourist districts, to 1965, when a raid on a drag ball changed the course of queer history. Bringing to life the striking personalities and vibrant milieu that fueled this era, Nan Alamilla Boyd examines the culture that developed around the bar scene and homophile activism. She argues that the communities forged inside bars and taverns functioned politically and, ultimately, offered practical and ideological responses to the policing of San Francisco's queer and transgender communities. Using police and court records, oral histories, tourist literature, and manuscript collections from local and state archives, Nan Alamilla Boyd explains the phenomenal growth of San Francisco as a "wide-open town"—a town where anything goes. She also relates the early history of the gay and lesbian civil rights movement that took place in San Francisco prior to 1965. Wide-Open Town argues that police persecution forged debates about rights and justice that transformed San Francisco's queer communities into the identity-based groups we see today. In its vivid re-creation of bar and drag life, its absorbing portrait of central figures in the communities, and its provocative chronicling of this period in the country's most transgressive city, Wide-Open Town offers a fascinating and lively new chapter of American queer history. Nan Alamilla Boyd is Assistant Professor of Women's and Gender Studies at Sonoma State University.